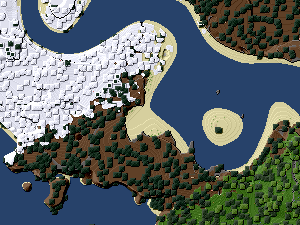 The minetestmapper creates 2D maps of your world, where one node corresponds to one pixel. This describes the usage of the C++ minetestmapper. The usage of minetestmapper.py is similar. Make sure there is a colors.txt in the same folder as the mapper. The default one does not support any mods. You can download VanessaE’s more complete colors.txt, containing support for hundreds of mods. Having Minetest running in place, you might have to modify the world path. The geometry option allows you to define an area to map. Use it between “./minetestmapper” and the input “-i”. Currently, there are three mappers. It is recommended to use the C++ version. The minetestmapper rewritten with C++. It is much faster. The code can be found on GitHub. An improved version of the Python mapper with many additional features, like side view, scaling and fog. It is 8 to 10 times faster than the original minetestmapper.py, but still slower than the C++ version. Information about installation and usage can be found in the forum.